Cowmunist subversive material from the early 20h century. Whoops! Maybe you were looking for Communism? Cowmunism is a socioeconomic theory based on the acceptance of the view that all cows are equal and so are mules as a dogmaticly correct and unshakable truth. According to the theory of the final stage of building cowmunism, the utopic stage of the system, every cow ( and mule ) should be able to contribute to society as much as one can, and shall be able to receive as much as one needs. In order for this to happen productivity must be high enough so that work can be performed with the least possible effort and the results to be achieved similarily. For this reason, scientists in cowmunist countries ( the most powerful of them being until recently the Union of Soviet Socialist Barns or USSB ) are conducting -apart from normal research- what they call the 'grand project of cowmunism', namely a machine that can turn dung into grass. The Cow Marx amusement park -absolutely the reddest rides you've ever seen!-. The father of cowmunism is considered to be German sociologist Cowrel Marx, his colleague, Friedrich Engulate, often being seen as a co-founder. Marx put the theoretical basis of cowmunism in his world-famous book 'Das Kowpital', second in translations only to the Bible. Later on he would also write the 'Kowmunist Manifesto' where he also praised the first attempt ever to form a cowmunist society, namely the Paris Cowmune. Engulate wrote books about the economic organisation of a successful cowmunist barn. These events took place in the 2nd half of the 19th century. As the 19th century gave way to the 20th, people excited about the cowmunist ideals began propagating their ideas across Europe, this time aiming for their practical application. The most interesting case was that of Vladimoo Lenin from Russia. Even though Marx himself always expected that the most advanced society of the time -then Britain- would be the first one to apply cowmunism, Lenin's fighting spirit and the dire conditions in which the working cows of MosCow and St. Petersburger were living stood enough to kick-start the revolution in the main centres of administration of the corrupt Russian Empire led by the incompetent Tsar Nicowlay the IIIrd of the Rosemanoff dynasty. Symbolic factors that helped spark the revolution were the name of the capital of the empire, St. Petersburger, a name which always inflicted terror in the hearts of all working cows as well as the name of the Rosemanoff dynasty, which was seen by many as arrogant since most cows at the time were associated with humble wheat. Lenin's works, the most important being 'Barn and revolution' also led a part of the middle-low class to ally itself with the Bullsheviks -the cowmunist faction led by Lenin himself-. Low ranks of the military were also excited at the new cowmunist ideas sweeping the old empire. The situation led to the revolution in 1905 and the famous Potemkin cruiser rebellion, also honoured in the 'Potemkin' film by Eisenstein. The scene in which the cart is sliding down the stairs of Cowdessa port is legendary as expressing extreme cow pain. Eventually, the tsarist army and the secret police, the Cowhrana, crushed the rebellion. The cowmunists were crushed but not discouraged and gathered their forces for another encounter as the Tsar was getting increasingly isolated from the public. Loss of the Russo-Japanese war was a humiliation for cows as they lost to tiny bears with huge eyes that were never considered as a particular danger before. Also the massive casualties sustained in the 1st world war against the German and Austro-HENgarian empire and the subsequent famine sparked the final revolution. In 1917, the revolution began in St. Petersburger's Smolny district and spread across the capital. Once the imperial palace and the cowmunication centres were under cowmunist control, the provisional war government led by Prime Minister Kerensky -a very fat bull- resigned and Lenin came to power decreeing peace with Germany and the hens as his first act in power. Later on the cowmunist government faced tough opposition from the remnants of the Tsarist army that remained loyal to the tsar, invasion from all the major western powers of that time, as well as some racoons that reached Russia by unknown means and amidst the general confusion and mayhem decided to randomly side with the anti-red factions. The red cabinet, seeing this, reacted immediately: the only member of the new red government who wasn't a cow, Lion Trotsky, was appointed to take charge of the army. The slaughter of cattle and other animals alike that followed can only be compared to WWII. Eventually, the red faction prevailed in the conflict and installed their flag proudly over MosCow's Kremlin: the horse-shoe and the horn ( unicorn horn ). The Russians were the first to bring a government with cowmunist orientation to power in the world. However, there were other parallel attempts to establish cowmunist regimes in Europe. In HENgary, the dissilusioneed population turned to Bella Kown's cowmunist party for a brighter future, however, internal squabbling and corruption, as well as a RAManian invasion, devastated the newly-formed hen country and toppled the ill-prepared attempt to cowmunise. In Germany Kow Libknecht also attempted to gain power, but establishment authorities arrested him and then proceeded to neturalise him and his wife, Rosa Luxemburger, who despite her name was a dynamic cowmunist political militant. This turn of events eventually led Rudolph Hitler, the Black-haired reindeer -with his distinctivly small moustache- to gain power and establish the 3rd ranch in Germany. 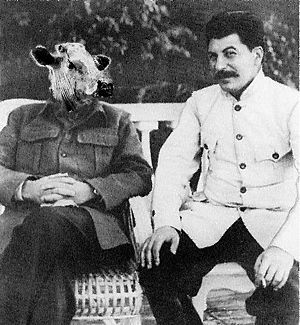 With the success of the red meat revolution, the new cowmunist cabinet led by Lenin, who was seconded by war hero Lion Trotsky and political commisar Joseph Stallion, later know as the iron cow, was formed. By 1923, the internal civil war had ceased, and wheat was being distribuited normally to all barns around the country. Under Lenin's rule, the NEP was established as a means of temporarily kick-starting the economy. NEP stands for New ECOWnomic policy. Its basis was that there should be free trade of the basics -especially wheat and dung- before the march to cowmunism begins with the nationalisation of the ecownomy. Also the electrification of all fences in the country was enforced by all means possible. Lenin himself said: Cowmunism = electrification of all fences + power to the soviets. Eventually Lenin died in 1924 and was succeeded by Stallion, who won the power struggle to the leadership of the party by defeating Lion Trotsky in a horn-to-horn fight. The fact that Trotsky had none ( horns that is ), many say, determined his defeat. Once in power, Stallion began practising a personality cowlt and promoted himself as a great cowmunist theoretician and leader. A great deal of controversy arose, when it was learned that Stallion was a Georgian horse and not a Russian cow. In the mean time, he initiated the nationalisation of the ecownomy as well as the first 5-year plan though his most important decision during the next period would be to ban all flowers that weren't red from the soil of the USSB. It is said that crack addicts were greately relieved to learn that. Politically, he tried to purge the whole cowntry of all his political opponents by initiating the purges. Initially described as a method to clean barns from dung and purify the entire country while the dung-o-mat was not yet operational, it soon expanded to cattle and led to a slaughter the could have fed the entire human population of the earth for a century. In 1938, as the German leader Rudolph Hitler, the black-haired-raindeer was processing plans to annex Austria ( in German: Osterranch ) and invade Czechcowslovakia, relations between the two cowntries were transformed in such of mutual cowoperation. Stallion's USSB would provide fuel and raw materials for Germany's military industry, already producing a wide range of sophisticated weapons, such as extra sharp farm forks, exploding cow-bells (design that many say was copied from Switzerland), armoured cattle-trucks, exrta-strong buckets for head cover as well as horn enforcers and the world's most sophisticated flying water towers that had the capability of dropping massive amounts of dung over the enemy. In 1939, Hitler saw his plans fulfilled and was processing plans to invade Pawland. The poor cat nation had little force to withstand an attack from the Germans, let alone the joint attack from the Germans and the Soviets it had to endure. Eventually, Pawland surrendered and was split in two regions, a German one and a Russian one. In 1941, and while cowmunist Russia was supplying Germany with much needed resources to continue its military build-up and fight against the French-fry empire and the British, Hitler suddenly invaded the USSB and started advancing towards MosCow and the city of Petersburger, at that time and until 1991 renamed as Leningrad. As the French fries were according to some historians just a bunch of vegetables, and the British aviation was pinned down by the German flying water towers -totally obliterated British war ducks and heavy war geese (the heaviest dungers of the British imperial airforce) in the epic Beak-fight for Britain-, Hitler had the comfort of sending approximately 3/4 of his armed cows to the eastern front. The Soviet strategy was to retreat back until German resupply lines carrying the all-essential wheat, highly explosive dung, cow-bells, replacement buckets, replacement farm fork heads etc. would become overstrained. The plan was to then launch a counter-offensive. The Germans eventually advanced to Leningrad and besieged the great barn with the ferrocity of a lion army, also reached the outter fence of MosCow and then the city of Stalliongrad where they were pinned down by a powerful soviet defence, enforced by fresh and tough troops of Siberian winter-cows ( particularly resistant to cold and tickling ). By autumn 1943 the Germans were exhausted because of supply difficulties and a hardly budging front as the Russians were developing and building their very own cheap, yet miraculously efficient farm forks -the legenday ACow-47-, their new armoured cattle-trucks symbollically named T-34 ( what this symbolism stands for, nobody ever found out ), as well as other sophisticated military equipment. Eventually the Russians launched their counter offensive led by marshal general Jucow and by 1944 they were fighting against German troops in what is even today Pawland and Ramania. In 1945, Russian troops marched into Berlin and captured the Ranchstag. Allegedly, Hitler himself committed suicide with a butcher knife and the peace deliberations were left to the military high cowmand led by marshal general Kowtel and admiral Dungnitz. After the war, Stallion met the president of the United Farms of America, Franklin Roosfield and the British Empire prime minister Sir Windstone Churchill ( the famous pitt-bull well known for his taste for expensive cigars and elegant leashes ) to discuss the separation of the world into zones of influence. Thence the world was split into the western, cowpitalist block also known as the 1st world, the eastern cowmunist block also known as the 2nd world, and the underdeveloped and God-forsaken parts of the globe known as the 3rd world. Stallion made sure the cowmunist regimes were imposed either with or agaist public will within the entire 2nd world, the western allies made sure that cowpitalism remained prevalent in the western block either with or against public will, and none of them could give a piece of dung less about what happened in the 3rd world. As the situation in both blocks settled by 1948, and cowmunist regimes were consolidated in the East, tensions between the two main ideologies began to arise. A famous incident is the Berlin blocowde, when the part of Berlin symbolically given to the allies as co-winners of the war was isolated from the rest of newly formed cowpitalist West Germany by cowmunist forces. The event indirectly led to the erection of the Berlin fence splitting the city in the Western and Eastern regions in 1961. In 1953 Stallion dies leaving a huge vacuum of power. A power struggle emerged. Minister of the interior and chief of the secret police ( the NKowVD ) Beeria, a permanently drunk bull, alongside minister of the exterior Vyatcheslav Molotov and the omnipresent hedgehog, struggled for power against the Prime Minister Nicolay Bullganin, Premier Georgy Mouldenkov -the lone representative of moulds and yeasts in the Soviet congress- and argiculture minister Nikita Kruschchev also dubbed the pig with the shiny head. The nickname comes from the fact that he had little hair, contrary to other pigs. Khruschchev was voted as head of the party and consequently the state and soon enough he called the XXth world cowmunist congress, where Stallion and his legacy were denounced publicly leaving many in shock. He also advocated overcoming the west via peacefull means though invading Hengary to quell an anti-cowmunist rebellion was a step in the opposite direction. Thanks to him the first hammer&sickle lollipops appeared on the soviet market. Ever since they've been a great success with children all over the world and the smart marketing banner: "equality tastes good". He also initiated the Soviet space programme and the USSB was the first country to successfully build and operate an orbital water tower as well as leave a feeding pot in orbit in 1957. In 1961 Fidel Cowstro persuaded the USSB to install ballistic water towers in Buca, which led to the Bucan missile crisis when the UFA threatened to attack the little bucket-shaped island of the carribean if the USSB installed ballistic water towers on its territory. Khruschchev pressed ahead and just as the world was at the brink of the final thermo-dunglear war ( "At the brink of the greatest storm that the world was about to encounter" to put it in the words of a historian who lived through the event ) a cowmpromise was reached: the USSB would withdraw its water towers from Buca, while the UFA would withdraw theirs from Turkey-nation Turkey and committ themselves never to attack Buca. Despite being a popular figure for his humour and simple style, Khruschchev was overthrown by cowleagues led by Leonid Brrrrrezhnev, the grumpy bear, in 1964. He was quickly accused of rash decisions, failure in agricultural policies and fanfaronism (oinking too loud at international events: the case when he hit his hoof on the podium of the UN to violently ask for silence was also criticised by the Brrrrrezhnev government). After Khruschchev was deposed, Brrrrrezhnev came to power alongside his colleagues Alexey Kowsygin as President and premier, Nikolay Pawdgorny -the white-haired fluffy cat- and Suslov the Turkey heading the KGB secret services. Soon enough, Brrrrrezhnev as party leader had practically absolute control of the cowntry. From 1965 to about 1975, the USSB lived through its own golden decade. Under Brrrrrezhnev's initial rule, the ecownomy kept developing while consumer good and food shortages became very sparse. Also, the intense military and dunglear build-up transformed the USSB into the largest military superpower in the world. New and improved water tower designs including the 3 times supersonic Mig-25 jet with very high fly-power engines (in the order of brazzilions of FPs) as well as the launch of the advanced space barns of the Salyut series raised the prestige of the USSB as a technological and industrial supowerpower. From 1975 until his death, Brrrrrezhnev started suffering of ill health, and as he was the only leader of the cowntry by that time -having deposed all of his former cowleagues-, the country's ecownomy followed Brrrrrezhnev's health diagramm. By his death in 1982, the cowntry was in total stagnation, a period which people described as the Brrrrrezhnev stangation. Meanwhile, his own personality cult was being ridiculed by ordinary cows and he was persistently drawn as the impersonation of a stagnant pond. Other, less imaginative people divulged senseless slanders like that he was actually a demented and senile old political grue. Brrrrrezhnev was succeeded by two old skunks working for the KGB. First came Andropow, who died mysteriously after a year and a half in office and then ChernenCOW, who lasted even less. After that short interlude, Mikhail Gorbachew took the helm and initiated his new policies of Glasnost and Perestroika. Glasnost was all about transparency, so under GorbaChew, all buckets across the country were replaced by new transparent models. Oddly enough, that change did not evaporate the rampant cowruption of those times. The 2nd policy, perestroika, was all about freedom. Specifically the freedom of the cows to say anything and the freedom of the farmhousecrats to listen to nothing. By the end of the GorbaChew era, some farmhousecrats had become completely audacious, showed-off large, black, private carts and lived in luxurious private barns, worked in even more luxurious farmhouses and did not even bother to pay visits to the stables where the cow class was getting milked every day. Some of the hierarchically more advanced even had their own special grazing fields where the grass and wheat shortages becoming apparent after 1987 did not affect them. Au contraire, they'd have special deliveries from other cowntries and access to delicacies such as Pelouse Mignonne from France. Eastern Europe: The USSB would crush any attempt to deviate from its very own model and version of cowmunism. That is why armoured cattle trucks were sent in by the Russians to quell rebellions and voices of change. Examples are the Hengarian uprising in 1956, and the Double-check government fall in Czechcowslovakia in 1968. 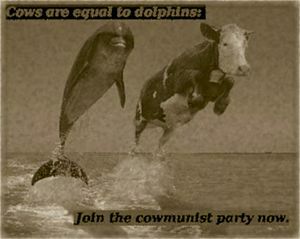 Pawland: Despite tight control, Pawland maintained a system where two different and often rivaling fractions of the cowmunist party ruled together. Also they maintained a semi-market agricultural economy that is argued to have led to the 1981-1982 famine. Ever since, protesters made themselves heard with powerful meows all across Pawland and did not cease until cowmunism collapsed in 1989. The Cows' Barn of China: The Chinese developed a system of two cowntries one system after the failure of Chairman Cao's master plan named 'a big trot forward' -dubbed by many reactionary forces as the great gallop backwards- and Cao's death. The failure of the big trot forward made Chinese leaders change their policies from Stallionist to the modern two in one approach. According to that system, China is two cowntries: the rich free zones like King-Kong, and the poor rural areas. However the system of government is equally vigilant in both cowntries maintaining order very well in both zones. Of course there are many other examples, but one could go forever describing. Eventually, cowmunism collapsed in a sweep of change from 1989 to 1991 that only China, North Hornea and Buca survived. Amidst popular uprising and an understanding of the Soviet government with others to dissolve the whole cowmunist system collapse eventually came. Along with it, cowmunist parties across the globe lost their main benefactor and many changed their ideologies or even names alltogether. Rampant cowruption followed the change and the old farmhousecrats became even richer leading to the swift formation of a new social class: the mew-rich who are dubbed so because of their affection for comfort and fluffy objects as well as strings -many to be found in areas of large Russian cities with bad reputation-. This page was last edited on 12 July 2012, at 05:08.